I took Mazzy for ice cream last week and she started crying because, get this— HER SCOOP OF ICE CREAM WAS TOO BIG. Nothing like a child ruining the moment you decide to reward them. I found myself channeling Tom Hanks in A League of Their Own with something along the lines of, "There's no crying while eating ice cream!!!!" In reality, there's no crying as long as I put half of her ice cream in one cup and half of her ice cream in another cup with the cone on top. Then we can all calm down and enjoy ourselves. Well, at least until Mazzy drips some on her leg and acts like now she has to have it amputated. Anyone else really annoyed with their three-year-old right now? 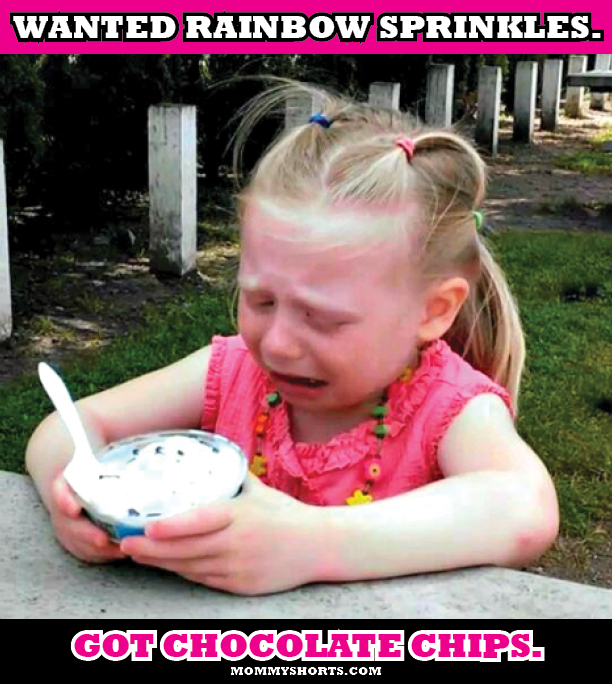 Inspired by Ninja Mom's Cry Baby Captions, and to make myself feel better, I thought it would be hilarious if I did an entire post of kids crying over ice cream. 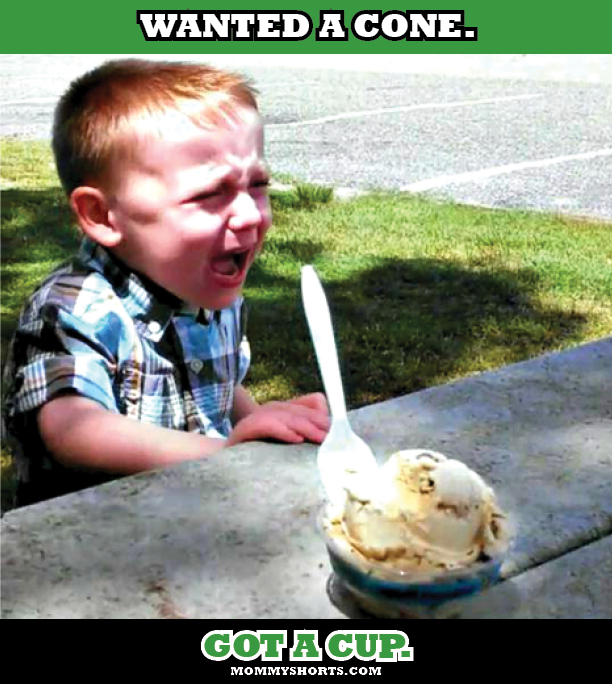 Including the devastated kid up top, here are 19 TOTALLY RATIONAL reasons for kids to cry over ice cream. Maybe you've experienced one or two? Next time, just skip the treat and give them a vegetable. Crying over broccoli is at least something we can all understand. Got a horrific tale of ice cream gone wrong? Please share below. Share your funny baby pictures on the Mommy Shorts Facebook Fanpage. Cute. In all fairness the kid with the hello kitty doesn’t look like he’s crying, just like he’s wet from some summer fun and got caught at a funny angle. I’d definitely cry if I lost half my ice cream, or if someone made me wear a bib AND a towel on my lap to eat a popsicle. geez. Oh my yes I can relate. Anytime my 3 year old Jude gets a drop of ice cream, popsicle, or any liquid for that matter on himself he acts like he is being burned by toxic acid. And don’t even bring popsicles in my house he will eat a box in one day. I have had to resort to locking them in a toolbox inside of the freezer. How’s this “Wanted Popsicles, got to the freezer and realized I already ate all 20 of them” Ok not as great a caption as some of yours but seriously. What is it with kids and ice cream? Glad mine isn’t the only 3 year old with a serious ice cream problem. This was very entertaining. Great read for a busy Thursday haha. My son would definitely be like the last kid -wanted ice cream. finished it. I was so excited to make RootBeer floats for my 3 yr old the other day. Hyped it up he helped me buy all the stuff for them, helped me make them, then didn’t like it at all decided to just walk away from it then to eat it. What the hell is wrong with this kid! Or take them out for ice cream because you’re feeling nice, and then endure 6 days in a row of whining because you’re *not* taking them out for ice cream. No good deed goes unpunished! I think my husband could be substituted in for most of those, especially the last one. Finished it is my fave. Thanks for calling me out! How about wanted frozen yogurt, then said he wanted ice cream like his brother, got ice cream, cried that he wanted frozen yogurt instead. That was my three year old yesterday. I laughed at myself because the words “I am not giving you any frozen yogurt until you try a bit of your ice cream!” came out of my mouth! Oh so funny! Thank you for re-posting this!